It's a crowded ice cream shop at 8 o'clock. There are little kids, parents, and teenagers everywhere, all of them eating ice cream or drinking bubble tea. You can't help but notice everything they put near their mouth is a plastic spoon or a plastic straw. You think about how much waste is produced by this single ice cream shop every night, considering there's at least twenty people surrounding you at the moment. Thankfully, you won't be contributing to that waste. You pull out your reusable straw from your bag. It's being protected by a uniquely beautiful denim straw sleeve. You don't go anywhere without this sleeve: It keeps your straw safe from touching anything else in your bag. Also, thanks to its special design, your straw stays put in there and doesn't slip out. You put the sleeve on the table you're sitting at and use your straw to drink the bubble tea you ordered and can't help but notice people are watching you. They don't say anything, but you can see they're intrigued by your straw, and its sleeve. Some people even smile at you and compliment your straw, or ask about the sleeve, which leads to a conversation on zero waste living. When you're done drinking, you wipe off the straw using a reusable napkin (you'll clean it when you get home) and put it back in its sleeve. Guess what? You just saved one more plastic straw from being wasted. Not to mention, you got other people interested in zero waste living too. This could be you thanks to StrawSleeves, a company dedicated to providing a practical way to carry reusable straws while traveling, shopping, or eating out. By simply using a straw sleeve to transport your reusable straws, you'll be able to attain this sort of life. 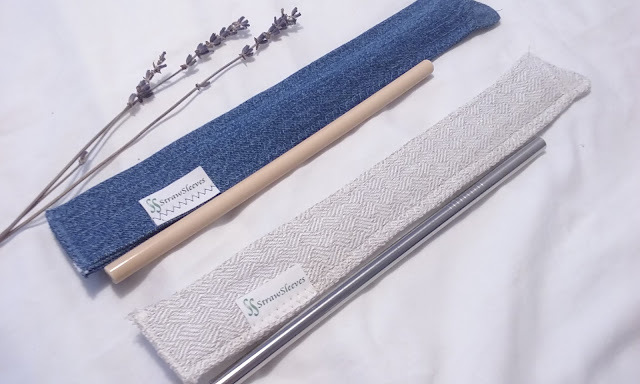 You can buy reusable straws (bamboo and stainless steel ones) on StrawSleeves' site too, but their main focus is the straw sleeves (which make transporting the straws a cinch). 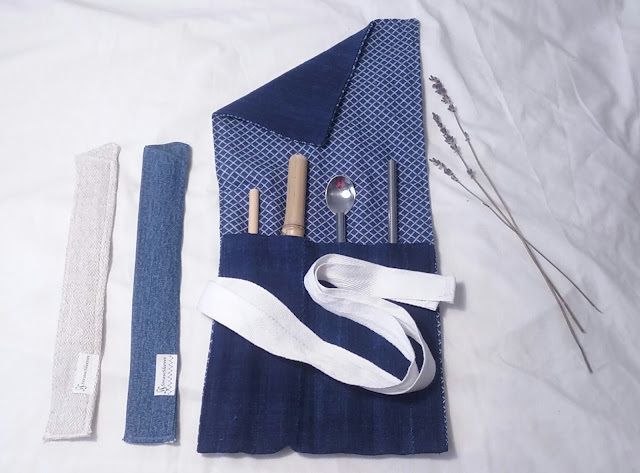 They offer single straw sleeves (you can choose from two materials: reclaimed denim or 100 percent hemp), and multi-utensil packs. The single straw sleeves are ideal if you already have one reusable straw and just want something to keep it safe and secure in your bag. The multi-utensil pack is perfect for someone who already has several reusable straws (maybe of different shapes and sizes) and likes carrying all of them at once. I recommend the multi-utensil pack for those who aren't sure how many straw sleeves they'd want, since it has multiple slots. Either way, both products will make your life so much easier. Perhaps the coolest part about straw sleeves (and the multi-utensil pack) is that they aren't just for straws: You can use them for carrying cutlery, makeup brushes, and even art supplies. I personally love using one of the sleeves to carry around reusable chopsticks! Cheri Newcomb, the owner of StrawSleeves, was kind enough to send me two straw sleeves, a multi utensil pack, and some reusable straws. I tried them out for a full week and lets just say I'm excited to share my results. Ready to see what I thought? Keep reading! Both the reclaimed denim and hemp straw sleeves - pictured with a bamboo and stainless steel straw. Why you want it: These handy sleeves protect your straws from bumping into things in your bag. Plus they're plastic-free and machine (or hand) washable. My review: I'm no stranger to reusable straws: Before I joined the zero waste movement, I bought a glass straw. I thought it looked really pretty and loved how eco-friendly it was. The problem? It came with a plastic carrying case. As you know, it's best to try and avoid purchasing plastic, as we already have more plastic than we can handle on earth. That said, these straw sleeves are the perfect alternative. They're completely plastic free and made from eco-friendly materials. The blue one is made from reclaimed denim and cotton blends, while the white (Natural colored) one is made from 100 percent Romanian hemp. 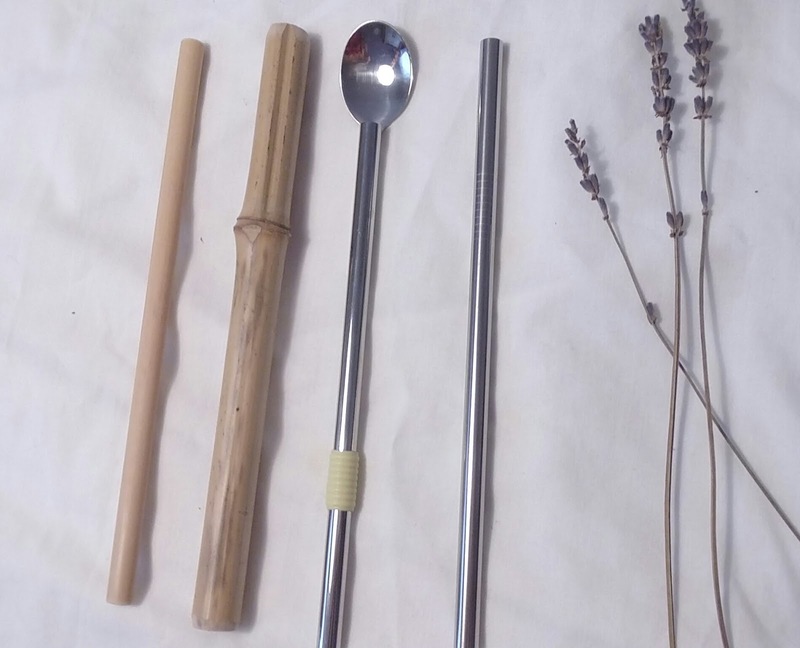 The hemp sleeve straws are available in other colors too (mine is considered Natural): Black, Green, Purple, and Blue. The reclaimed denim one comes in both blues and in earth tones. They're designed to hold almost any size straw in varied widths (and bends). They can carry anything up to 8 to 9 inches in length. Pretty cool, huh? Personally, I love both of these straw sleeves and find it hard to choose which I like better. 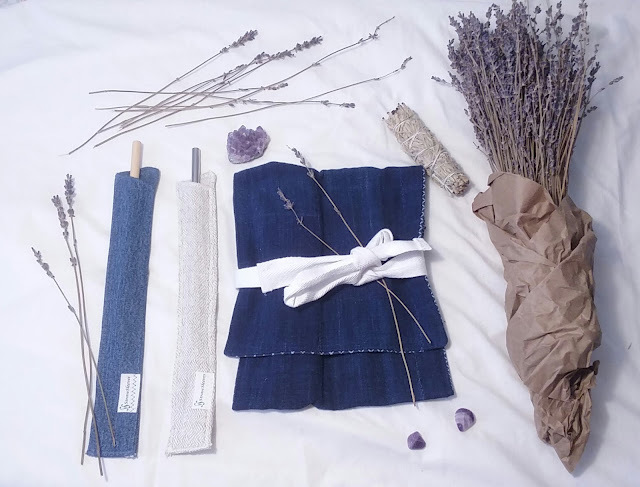 I actually use the reclaimed denim one a little bit more than the hemp one (maybe because it matches the multi-utensil pack a little more). There's not much of a difference between them in terms of functionality, that's for sure: They both work great. To use, I simply slip a reusable straw of my choice into the sleeve. It stays put because the straw sleeve has an "invisible inner cuff" that prevents the straw from sliding out of the pocket. That's why it requires no ties or fasteners, which is awesome. After the straw is in the sleeve, I just plop it into my bag. Straw sleeves work well with tote-bags, glove-boxes, pocketbooks, backpacks, or even picnic baskets. I usually pair the straw sleeves with the straws you see in the picture above (also provided to me by StrawSleeves), or with a pair of chopsticks (pictured below). Heck, I could even keep my glass straw in this sleeve because it's so secure. When I want to use the straw (or chopsticks), I just pull it out. After I'm done using the straw (or chopsticks), I just wipe them off and put them back in the sleeve. I usually wash the utensils when I get home, since it's not always convenient to do in public. Either way, these straw sleeves certainly come in handy. They're also quite durable too: Both the hemp and reclaimed denim ones are self-lined and triple stitched to hold up to frequent and repeated machine (and/or hand) washing. Personally, I'm just going to hand wash them in the bathroom sink, but they haven't gotten to that point yet. They're still super clean, so I probably won't have to wash them for several weeks. I totally recommend these to anyone who wants an easy way to store their straws (or utensils) on the go! 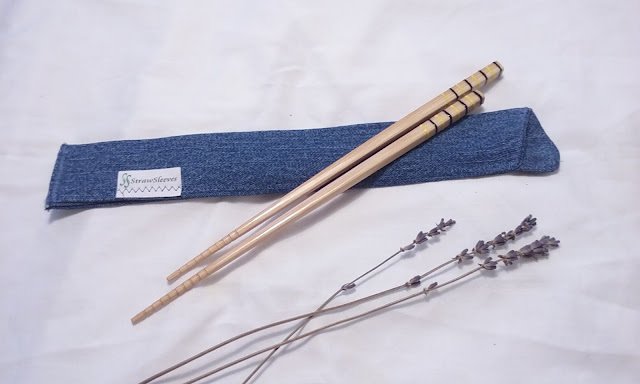 I like to use the reclaimed denim straw sleeve to hold my chopsticks! The chopsticks were given to me by my dad. He bought them when he was younger in China Town. Vintage! The multi-utensil pack - pictured with two bamboo straws, a spoon straw, and a stainless steel straw. Why you want it: This awesome multi-utensil pack is perfect for stashing cutlery, makeup brushes, and even art supplies in one secure place. My review: I've always wanted a multi-utensil pack. Well, at least since first seeing one in a zero waste group. I was scrolling through the group and looking at pictures other members were sharing, and one was a multi-utensil pack they made themselves. While I certainly admired their handiwork, I am no seamstress. I don't even have access to a sewing machine and even if I did, I would probably wind up sewing my own hand. Thankfully, StrawSleeves sells these amazing packs that do the handiwork for me. The one I received is made from reclaimed denim and cotton, but there are so many different options to choose from. Here are only a few color options: Pink with purple print, charcoal print with stripes, off-white with purple print, and so much more. I'm in love with how cute the pattern is as soon as you open it. This pack is perfect for fitting any sized straw or utensil. In the picture above, I used it to carry two bamboo straws (one for bubble tea/smoothies, another for regular drinks), a stainless steel straw, and a straw spoon (literally a straw with a spoon on the end). That said, you can carry anything in this baby. There are four slots, but they're pretty roomy. Lets say I wanted to carry around art supplies: I could fit up to 6 colored pencils in each slot, which I tested myself so trust me on that. Or, lets say I'm a makeup artist and want to bring makeup brushes with me to a client. Easy-peasy, this pack will hold at least four brushes (maybe more per slot, depending on the length and width of the brush). It's also great for holding cutlery, which is mainly what I'm going to be using it for. 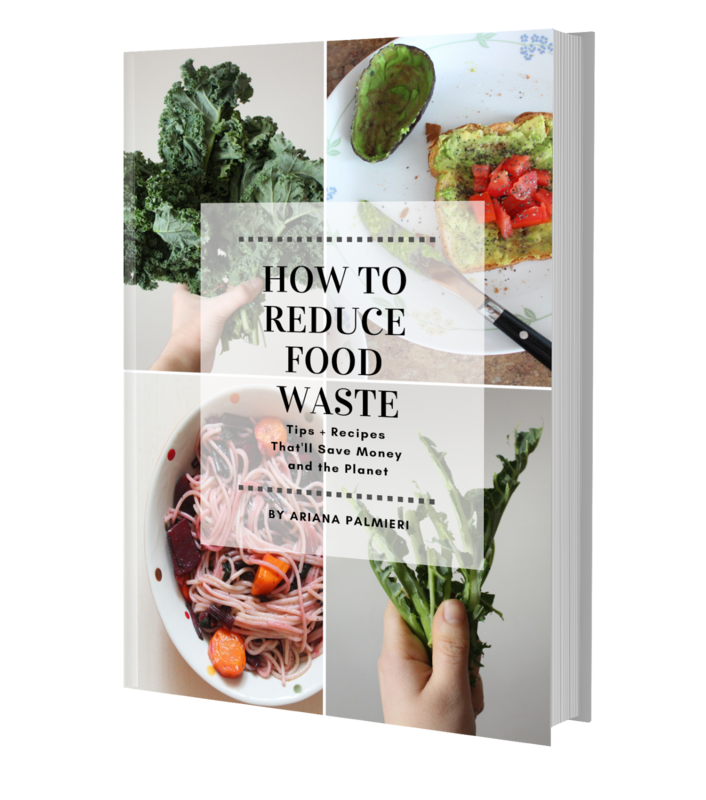 Eating out, especially at places like malls or fast food chains, isn't always the most zero waste. Usually, you'll only be offered plastic cutlery (cannot say how true this is - every time I eat at the mall in the food court it's the only thing offered). This will help me stop relying on that. It's perfect for storing a fork, spoon (better yet, a straw spoon), and a knife. Even chopsticks! If you like bamboo cutlery or stainless steel cutlery, great, because either will be safely secured in this pack. Instead of buying a whole set of portable cutlery, you can just buy this and take from what you usually use in your kitchen (for me, that's stainless steel). Once you secure all your utensils (or art supplies, brushes, etc.) in place, you simply close the flap and use the ties to secure it. 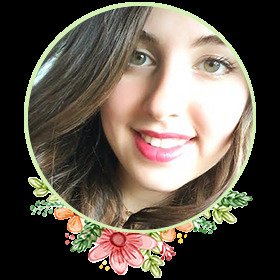 Make a pretty bow and you're ready to go! I plop it into my bag and it stay perfectly fine. When not in use, you can also fold it up and tie it so it takes up less space in a drawer or on a desk. I usually just leave it in my bag. It can also be machine or hand washed, but mine is still very clean. If I take care of it, I'm sure it will last me for years to come! I highly recommend this to anyone who wants to carry around reusable cutlery, makeup brushes, or art supplies (but doesn't want to waste plastic in the process). Plus, it looks really cute. The multi-utensil pack also works great with reusable cutlery, art supplies, and even makeup brushes. I received two bamboo straws, one spoon straw, and one stainless steel straw from StrawSleeves. All work amazingly! Why you want it: Each straw is great for something, and each one has a different, unique texture. All of them are certainly handy to have around and on the go. Its value: $4.46 - $21.61 (depends on the straw you get. The cheapest is the bamboo straw from Straw Free and the priciest is the straw spoon with a denim straw sleeve). My review: These are the straws StrawSleeves gave me to try out. They aren't the focus of their brand, but it's great that they sell them too. Makes it convenient to shop for everything in one place! If you love smoothies (or bubble tea, like me), I recommend checking out the bamboo straws they sell from Straw Free. They're very roughed and thick, so they're best for those kind of drinks. For regular drinks (like water, iced tea, soda, etc.) I recommend the smaller bamboo straw or the stainless steel straw. It kind of just depends on the texture you like, but I recommend stainless steel straws for people who don't like a woody texture on their straws. Both don't bother me though, so I use them interchangeably. I drink a lot of iced tea while out on about, so these certainly come in handy! Probably one of my favorites is their straw spoon though: It's made from stainless steel and has a silicone grip on it for easy convenience. You can get two of them with a denim straw sleeve included, or without. I usually put this straight into my multi-utensil pack, along with other cutlery. It's super handy because it doubles as both a spoon and a straw. Of course you'd have to wipe it off before using it interchangeably, but it's certainly handy! Ultimately, I highly recommend investing in one of these straws if you don't have any reusable straws yet. Even if you do, grabbing an extra one might do you some good. With all these different sizes and shapes, there's bound to be one that grabs your attention! StrawSleeves founder, Cheri Newcomb, was great to work with and was quick to send me my samples! When I received my samples, they came in a recyclable/compostable paper envelope with recyclable/compostable paper padding (super ecofriendly!). 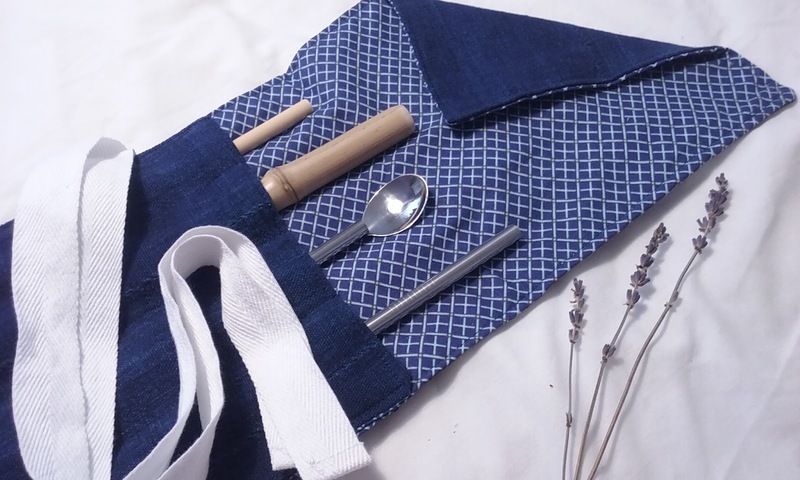 I love how each of these products is completely plastic-free and made from washable fabric (or, if we're talking about the straws, washable straws). Talk about a zero waste win! The straw sleeves are great if you don't have as much room, or simply want to protect one straw. The multi-utensil pack is so versatile and works with everything from cutlery to art supplies! I absolutely love these products and will continue to use them for several years - they're super durable! I love how the materials used in each product is simple, yet effective (reclaimed denim, cotton, and hemp). It's great that StrawSleeves also sells reusable straws. I'm especially in love with the straw spoon! Perfect for eating ice cream on the go, or sipping and chilling. These products worked great - they kept my utensils and straws clean and safe while in my bag. No fibs here! 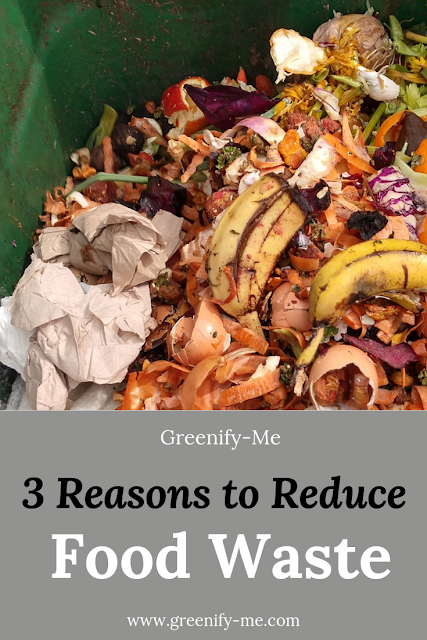 Using these products seriously minimizes the amount of plastic waste I put into the environment. Do you know how many straws are found in the ocean each year? I'm so glad I finally have a bubble tea straw that isn't plastic (I drink it pretty frequently, so this will greatly help me reduce the amount of waste I create!). 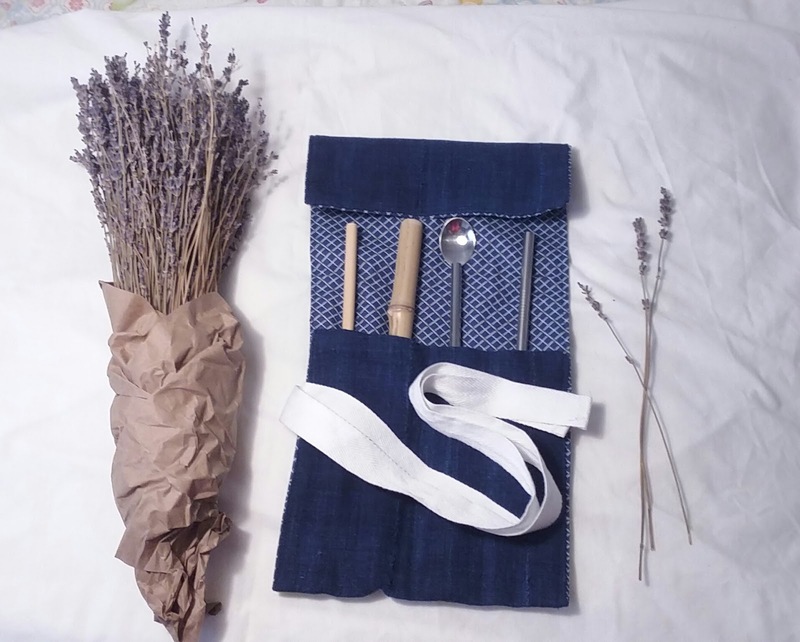 They don't just sell the items I reviewed: They also sell cleaning brushes, stainless steel straws with silicone comfort tips, and reusable shopping bags. Sweet! I wish I had more of their products! That's pretty much it. I literally cannot think of anything bad to say about this brand. They're doing so much good for the world! Conclusion: StrawSleeves are the best way to carry around your reusable straws. Period. They make everything from single straw sleeves, to multi-utensil packs. If you've been wanting to try plastic-free straws, but hesitated because you didn't know how to protect them in your bag, this is for you. Do the environment and yourself a favor and get yourself a sleeve or a utensil pack. They also carry a bunch of different straws if you're stuck on where to start. The multi-utensil pack is great for artists, makeup lovers, and zero wasters alike because it can be used to hold just about anything. Not to mention these make great gifts for family and friends! Also, be sure to follow StrawSleeves on Instagram, Twitter and Facebook for the latest updates on their high-quality products!